There are countless amount of ways to prepare noodle dishes and they are yummy any way you prepare it. 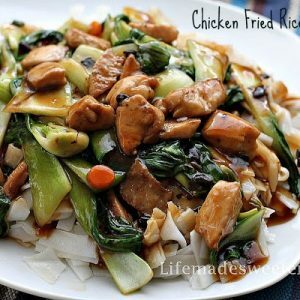 One of my favorite noodle dishes is one that we used to order at that Cantonese restaurant when I was younger: Chicken Fried Rice Noodles with Black Bean Sauce (Chow Ho Fun). Making this dish at home means I can use much less oil and I add in much more veggies and less meat which also makes it a great dish for using up any leftover bits from the fridge. I usually like using the fresh rice noodles (as pictured below) which can usually be found in the refrigerated section in most Asian markets. If you can’t find the fresh noodles, then you can certainly use the dried packaged kind. The fermented/preserved black beans give this dish a savory flavor with a hint of spice. The saucy gravy gives the noodles a nice silky texture and with every slurp, they will just slide and melt into your mouth with every bite. This Chinese noodle dish is so easy to make and perfect for weeknight meals. Packed with veggies, noodles, meat, and sauce, this wholesome meal is filling and delicious! Wash and drain the bok choy, trim and discard the ends. Boil some water with a dash of oil and salt in a large stir-fry pan or wok, place the bok choy in the boiling water for 1-2 minutes, drain water and rinse under cold water and set aside. Soften the shitake mushrooms in a bowl of hot water for 1 minute, drain and discard water. Slice the mushrooms into bite-sized pieces. Soften the preserved black beans in a bowl of warm water for 1 minute, drain and discard water. Mash the black beans with the back of a wooden spoon. Set aside. Marinate the cubed chicken with the marinade ingredients. Set aside in the fridge for at least 30 minutes. After the chicken has marinated, heat your pan with some oil on medium, add the cubed chicken to the pan and stir for a few minutes until browned. Remove chicken and set aside on a plate. Add the garlic to a fresh pan of a little bit of oil, stir-fry for 1 minute until fragrant, add the minced ginger, diced green onions, and shallot. Stir-fry for another minute. Add the carrots, shitake mushrooms, and preserved black beans until the carrots soften up a little bit. Add vegetables and combine. Remove from pan and set aside. Heat a little bit of oil, add the noodles and stir for about 2 minutes to separate the noodles but being careful not to break them apart too much. Remove from wok after the noodles are hot and set aside. Combine all the sauce ingredients in a bowl and stir. Add sauce to empty wok on medium heat, stirring often so the sauce does not clump together. Once the sauce boils and thickens up, turn down heat and adjust seasoning. Add more water if the sauce is too thick. Add the chicken and vegetables and mix well with the sauce. Pour over noodles. Serve immediately with rice or enjoy on its own. Yum, this looks SOOO good! Great pics! I want to try making this too, my mouth is salivating just looking at this! Hello, your recipe looks yummy! I have the Lee kum Kee Black bean sauce instead of preserved black beans..is it a good substitute for this recipe? And I’ve tried your crockpot lo mein and it was really good!